St John wrote a book containing thirty homilies. Each homily deals with one virtue, and progressing from those that deal with holy and righteous activity (praxis) unto those that deal with divine vision (theoria), they raise a man up as though by means of steps unto the height of Heaven; thus the book is called "The Ladder of Divine Ascent", and the saint is know as "Climacus". 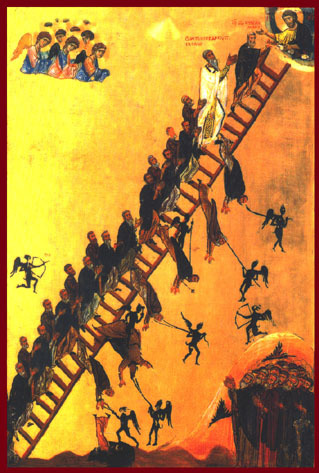 "The Ladder of Divine Ascent" is so greatly is this God-inspired book esteemed in the Orthodox Christian Church that its author, St. John Climacus, is celebrated twice a year - on 30th March (the day of his repose), and the Fourth Sunday of the Great Lent. Each monastic community of the Orthodox Church reads "The Ladder of Divine Ascent" during each day of the Great Lent, in their common dining hall (or refectory) during the daily meal. This is a period of strict fasting, struggle, prostration and extensive prayers; when only one meal is eaten in the day and after 3 pm, and water is only consumed during 3-6pm. "Let us try to learn Divine truth more by toil and sweat than by mere word, for at the time of our departure it is not words but deeds that will have to be shown" (Step 26:36). Saint John reposed in 603 AD, at eighty years of age. Like that lofty ladder which Jacob was reaching to the Heavens, even so, by your godly words, you have raised a ladder that brings all the faithful unto the heights of virtue, O blessed Father John. WITH the streams of your tears, you cultivated the barrenness of the desert; and by your sighing, from the depths, you produced fruit a hundredfold in labours; and you became a luminary, shining with miracles upon the world, 0 John our righteous Father. Intercede with Christ God that our souls be saved. As ever blooming fruits, you offer the teachings of you God-given book, 0 wise John, most blessed, while sweetening the hearts of all them that heed it with vigilance; for it is a ladder from the earth unto Heaven that confers glory on the souls that ascend it and honour you faithfully.